Land Raider Crusader "Throne of Vulcan"
This centerpiece model is the culmination of all my bitz and conversion work. I didn't drastically alter the hull of the model, though I did deck it out with little detail bitz that keep me looking at it from all angles. The most noticeable conversion is the dozer blade. Though no longer providing any benefit while playing, this adds bulk to the model (though it will be tough to paint). As a smal;l detail, I added an extra row of frag charges to the front (because I had them, that's why), fuel/promethium tanks and spigots on the rear (including an externally stored hose), ventilation fan, an extra comms unit, and a set of winches and chain to the top/rear. The floating tank concept is very impractical. To this end, I gave stabilizers to the artillery. These Whirlwinds have custom payloads and optics only to be surpassed by their custom feet. They fly with armor down, but the armor hinges out as they touch down, and provide much needed ground support when launching endless barrages of hell fire. The conversion itself is very simple: hinge up the extra armor from the Vindicator kit, add several pistons from dozer blades as well as 2 dozer mounting kits (easy to come by should you be copying my plow blade design for the Vindicators) make one Whirlwind. The conversion really speaks to me, and the model itself is static while telling a dynamic story. That is a recipe for miniature love, right there. This was the first vehicle model I converted. The FW extra armor and smoke stack from Cities of Death's Manufactorum fell into my hands at Blue Table, and somehow I conned Shawn into giving me two dozer blades to mutilate. This was also the inception of replacing the front plate of the Rhino chassis with CoD vents. Together, it makes sense. The wildly inaccurate mortar chell lobbed by a Vindi could only come from a mobile, floating mortar Extra bling in the form of a pop-up HK Missile and custom floating using superglue caps and specialized flying bases rounded out the conversions. When I started this army, I had no intention of building a coherent force out of it. However, the concepts that appeared here wormed their way into every inch: ubiquitous geared skull, floating EVERYTHING, Storm-bolter positioning, on and on. Not only is the Rhino chassis preserved, but it is enhanced in a way that is not totally outlandish and quickly recognizable. In other words, I am not putting down a Dr. Pepper bottle and calling it a Carnifex, I'm building my own little corner of the universe, related but unique. OK, so I saw the newest Space Marine swag before Games Day oine year and said to myself, "Self, you're broke. Make a choice." Instead of buying the Thunderfire, I bought the limited edition Techmarine which became my beloved Librarian HQ, the Archivor General. This piece was then started to fill the new slot. Clearly, the scale compared to the real thunderfire is way too big. This makes it a sitting duck. 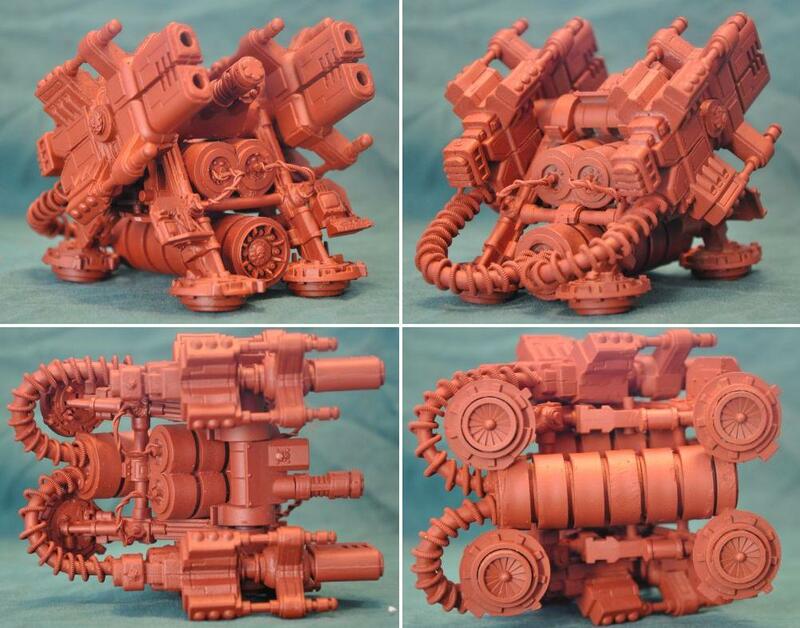 Stripping the battery cells (Leman Russ Wheels) down to the single large cell and reducing height and width would give it a much needed playability bonus. However, as far as goofy contraptions goes, this is it. 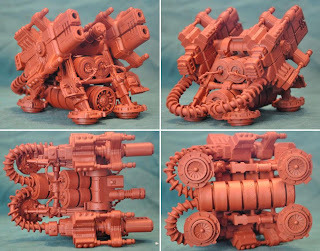 This could easily serve as an Anti-Aircraft Mount for Apocalypse or be re-engineered as the big gun on a converted Bane Blade.